Covered Porches: 354 sq. ft. Gross Area: 2,408 sq. ft. When people think about a home it is often a combination of design, beauty and function. In the Bayview House we have achieved all these qualities while reaching a price point that is attractive to the budget conscious home buyer. 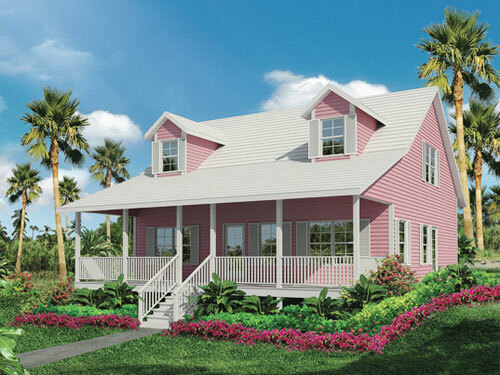 Our Bayview House is available with such options as dormer windows, privacy decks and covered verandas. Measuring 32 x 36ft., the Bayview allows the master bedroom with en suite bath to be secluded on the ground floor while the kids or guest bedrooms and bath are upstairs. Different bedroom layouts can accommodate Juliet balconies and covered verandas giving the Bayview House a unique Island flair.